April: On the road 12 out of 30 days. What does my house look like? May: Please allow me to hide in my house until I leave the state for another week and then madly prepare for a board orientation for the day job. June: Did I mention I was taking a stats class over the summer? No Monday or Wednesday nights for you! Oh, and most of your other nights are doing homework, lol. Also June: You know what would be a great time to run a major conference? While you’re taking an intense summer stats class! July: Stats class. Oh, and running another major conference, because that’s just brilliant timing. I can’t say I’ve been making a ton of food until the last few weeks, and even then it’s been “easy mode” – baba ganouj, grilled corn and X meat. Spouse has been taking on a lot more of the cooking than usual. But I’m loving the summer produce that’s available. Ohio’s peach crop was frost-killed this spring and lots of stuff has been later than usual, but we’re seeing lots of melons, peppers, eggplant, tomatoes (finally), squash, and even some cucumbers still – as well as the first apples of the season. Last night I made this roasted vegetable tart with odds and ends lying around the house, and it was both easy and tasty. One single-sheet pie crust (or two if you want to make a huge one). I made mine from this recipe (the food processor does make it easy!) plus a half-teaspoon of extra-fine garlic powder for a bit of extra savory yum. You could also use store bought pie crusts, puff pastry, or phyllo dough following the package instructions. A medium bowl of summer veggies: I used two small eggplant, one medium yellow summer squash, one onion, four small sweet peppers, and a handful of cherry tomatoes which had all split on the vine due to the ridiculous amount of rain we got yesterday. Some cheese. 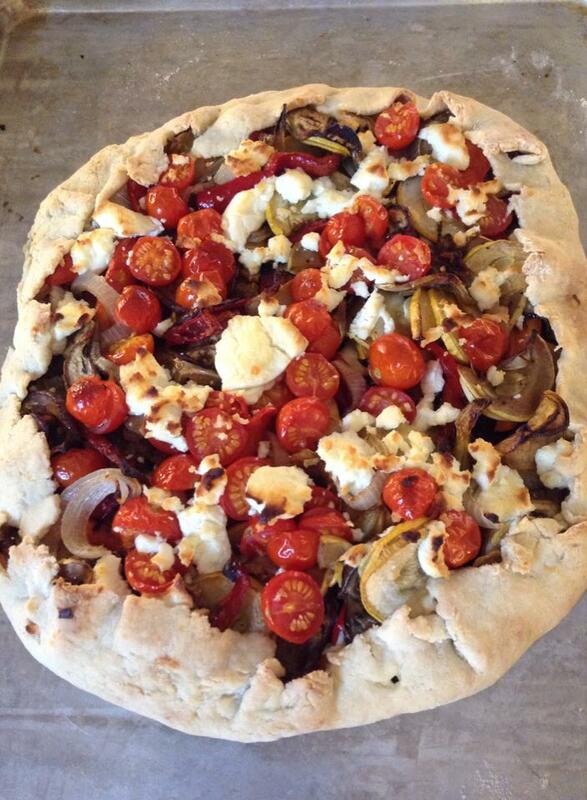 I used goat cheese; you could also use feta, gruyere, parmesan, whatever. Some kind of savory spread. I used some olive tapenade that I got at Aldi a while back; you could also use bruchetta topping, hummus, a spreadable cheese or cheese-and-egg base, baba ganouj, whatever. Do whatever you need to do with your dough situation to make it a single flat piece. Or you could do several small tarts, in which case you want several small flat pieces. Moral of the story: flat. Spread your flat piece(s) of dough with the savory spread, but unless you’re using a pan which your dough fills edge to edge, you might want to stop a little before the edge. Spread out your roasted veggies on your prepared dough-and-savory-spread situation. You’ll want them a little bit layered, but not so high that they aren’t going to cook through. Maybe 1″ high, tops. I had leftover veggies, and I threw them in the fridge to make an awesome roasted veggie pita with later this week. Put any tomatoes you plan to use on top. You don’t have to slice small cherry/grape/pear tomatoes, but you might want to slice larger ones. Apply cheese. Fold up the edges of your dough, if that’s an appropriate thing to do with the type of dough you’re using. Throw the whole thing back in the oven (still at 425°) for about 15 minutes or so, until the dough is a nice golden brown, the cheese is browned and/or bubbly depending on the type of cheese you chose, and it smells awesome. Go find something engaging to do while it cools for 10 minutes (otherwise you’ll try to eat it too soon and burn the heck out of the roof of your mouth). This thing is awesome warm and also awesome at room temperature, making it great for really hot days. I suspect you might also be able to adapt this into a kind of hand-pie recipe and take them out picnicking. Oh, and I realize it’s not Friday. Too bad; you get food on Labor Day instead.